In 1943 actor Clark Gable served as a Major in World War II, operating out of England's Royal Air Force station Polebrook (RAF Polebrook) as a member of the 351st Bomb Group. 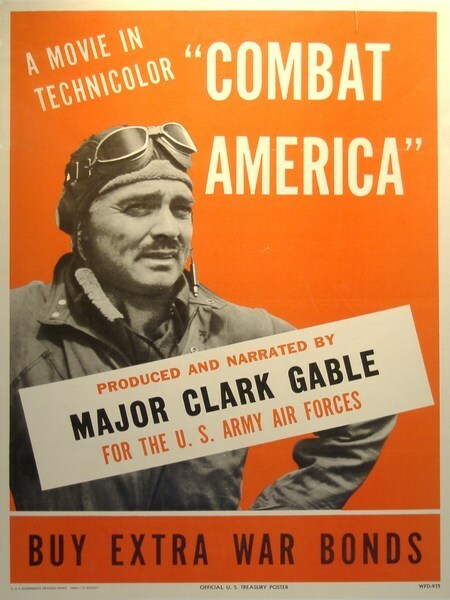 Gable flew five missions during his term, and was tasked with producing Combat America as a recruitment tool. He worked in partnership with unit members First Lieutenant Andrew McIntire, a former director of cinematography for MGM, additional camera operators Master Sergeants Robert Boles and Merlin Toti, and Hollywood scriptwriter John Lee Mahin. Together this team of seasoned industry professionals created an energetic and educational propaganda piece intended to motivate viewers to serve their country while doing the same themselves. Produced at a time when audience patriotism was at an all-time high, the film plays to the national desire to defend fellow man and country. Opening with footage of both civilians and servicemen looking to the sky in admiration of the fighter planes as they soar overhead, viewers are transported across seas for an inspirational look at the life of a bombardier. Featuring a playfully animated narration by Gable, we are walked through the process of gearing up for flight, from checking ammunition to assessing uniforms and safety gear. 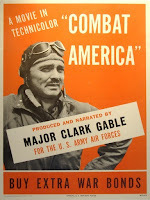 Gable gives a coaching voiceover as the planes take off, advising them on how to maneuver, take flight, and avoid crashing in a fiery blaze. Conversational moments with soldiers lend a personalized perspective to hum-drum aspects of serving, such as making small talk while cleaning their service weapons or chatting casually on the airfield. The action footage picks up when we join the bombardiers in the air, as they evaluate the enemy threat and plot their course of action. Gunners are shown on alert and ready at their turrets, acting promptly on the directive to fire. Culminating in a mass air-drop, the boys deliver their payloads and return to base. An adventurous and invigorating documentary, Combat America will hold great appeal to historical buffs and World War II enthusiasts. The film serves as a time capsule back to a fight that has not gone forgotten, allowing an unaltered depiction of the servicemen and weaponry of the time.